^ "Post-secondary Learning Act". Qp.alberta.ca. 2006-12-28. Retrieved 2012-06-20. ^ "Mandate - Canadian Institute of Ukrainian Studies". www.ualberta.ca. Retrieved 2018-01-19. ^ a b c d e f g h "University of Alberta Centenary - History". University of Alberta. Retrieved 31 October 2012. ^ "Percy Erskine Nobbs". Dictionaryofarchitectsincanada.org. Retrieved 2012-06-20. ^ "Herbert Alton Magoon (architect)". Dictionaryofarchitectsincanada.org. Retrieved 2012-06-20. ^ "Breton Soil Plots". Archived from the original on 2013-06-28. ^ "University Presses". The Canadian Encyclopedia. Retrieved 9 October 2012. ^ "Cobalt king remembers U of A with $3.5 million". University of Alberta. Archived from the original on 1 January 2013. Retrieved 31 October 2012. ^ "Record energy revenues boost province's surplus". Government of Alberta. 2005. Retrieved 7 November 2012. ^ Gerein, Keith (15 December 2008). "U of A watches millions vanish". Edmonton Journal. Archived from the original on 18 January 2013. Retrieved 7 November 2012. ^ Taves, Jonathan. "2010/11 tuition, fees could rise with $59-million gap". The Gateway. Gateway Student Journalism Society. Archived from the original on 21 July 2012. Retrieved 10 March 2012. ^ Stolte, Elise (15 December 2008). "U of A reels from $20M surprise cut; Staff layoffs likely as university copes with existing $59M deficit, provost says". Edmonton Journal. p. A1. ^ "U of A students tapped an extra $290". CBC News Edmonton. Retrieved 15 March 2013. ^ Dunning, Hayley. "Budget deficit, Mathewson, hazing rituals top campus news stories for 2010". The Gateway. Gateway Student Journalism Society. Archived from the original on 19 July 2012. Retrieved 10 March 2010. ^ Bennett, Dean (13 March 2013). "University Of Alberta Eyes Budget Cuts In Wake Of Reduced Funding". Metro News. The Canadian Press. Retrieved 10 April 2013. ^ "Budget Highlights". Government of Alberta. Archived from the original on 15 December 2015. Retrieved 2 November 2015. ^ "Institutional Strategic Plan". UAlberta.ca. University of Alberta. Retrieved 2 November 2015. ^ "Virtual Museum of Canada: Devonian Botanic Garden". Archived from the original on 2013-06-28. ^ "About the Faculty of Nursing". Faculty of Nursing, University of Alberta. Retrieved 30 October 2012. ^ "About Pharmacy". Faculty of Pharmacy, University of Alberta. Retrieved 22 August 2013. ^ "About Us - St. Joseph's College". St. Joseph's College, University of Alberta. Retrieved 2 November 2012. ^ "About the College". St. Stephen's College, University of Alberta. Retrieved 2 November 2012. ^ "University of Alberta Libraries". University of Alberta Libraries. Retrieved 2012-06-23. 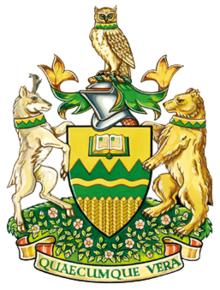 ^ "University of Alberta Libraries - About Us". University of Alberta. Retrieved 7 November 2012. ^ a b "Canada's Top 50 Research Universities 2018". Research Infosource. 2018. Retrieved 14 March 2019. 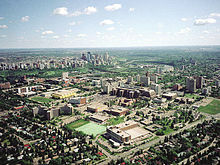 ^ "Edmonton home to Canada's senior women's basketball team". CBC News. Retrieved 22 August 2013. ^ "The power of partnership: Li Ka Shing Foundation gift and Government of Alberta funding to establish virology institute at University of Alberta". Archived from the original on 2013-01-15. ^ "Who We Are - University of Alberta Student Union". University of Alberta Students' Union. 2014. Retrieved 20 January 2014. ^ "Student Group Services". University of Alberta Students' Union. 2014. Retrieved 20 January 2014. ^ "About - The Gateway". Gateway Student Journalism Society. Retrieved 20 January 2014. ^ "CJSR 88". Retrieved 20 January 2014. ^ "About Us - Golden Bear and Panda athletics". University of Alberta. 2014. Retrieved 20 January 2014. ^ "University of Alberta: Sports". University of Alberta. Retrieved 4 September 2014. ^ "Intramural/Recreational Sports". University of Alberta. 2014. Retrieved 25 February 2014. ^ a b "Facilities". University of Alberta. Retrieved 20 January 2014. ^ "University of Alberta". Governor General of Canada. Retrieved 19 January 2014. ^ Green, Rebecca (12 July 2013). "College Songs and Songbooks". The Canadian Encyclopedia. Historica Foundation. Retrieved 19 January 2014. ^ Andrews, Marcy (5 December 2013). "Where You Live & What You Do". University of Alberta. Retrieved 19 January 2014. ^ "University of Alberta Student Numbers". University of Alberta. Retrieved 17 November 2014. ^ "Composer Malcolm Forsyth dies at 74". Canadian Broadcasting Corporation. 5 July 2011. Retrieved 19 January 2014. ^ "Richard E. Taylor - Biographical". Nobel Media AB. 14 January 2014. Retrieved 19 January 2014. ^ "Nobel laureate Derek Walcott passed away at the age of 87". University of Alberta. 17 March 2009. Retrieved 3 November 2018. ^ Dykstra, Matt (18 September 2012). "Ray Muzyka and Greg Zeschuk announce they are departing Edmonton video game development firm". The Edmonton Sun. Canoe Sun Media. Retrieved 19 January 2014. ^ "Pat Binns". Government of Prince Edward Island. Retrieved 19 January 2014. ^ "Premier of Alberta". Government of Alberta. Government of Alberta. Retrieved 17 September 2014. ^ "HON. DAVID L. EMERSON PC, OBC". Finning International Inc. 2011. Retrieved 19 January 2014. ^ "Former UAlberta law professor named to the Supreme Court of Canada". www.ualberta.ca. University of Alberta. Retrieved 17 August 2015.